The Orcs were supposedly created when the Daedric Prince Boethiah defeated the Aldmeri god Trinimac, transforming him into Malacath and his faithful, the Orsimer, into Orcs. When the transformation occurred is unclear, but Orcs have been inhabiting the Iliac Bay region since the early years of the First Era. Some reports say Orcs were in Morrowind acting as raiders and mercenaries as early as 1E 700. It is known that the Aldmer had already colonized the mainland of High Rock during the Merethic Era before Orcs emerged. They were viewed as a constant threat to the other races, especially after the Ra Gada drove many Orcs out of Hammerfell and greatly strengthened Orsinium. Several kingdoms banded together in High Rock and destroyed the first Orc kingdom in 1E 980. Without a home, prejudice against them was even greater. Many more Orsiniums appeared and disappeared after the first one. In the middle Second Era, Orsinium was controlled by the Daggerfall Covenant, and was given to Kurog gro-Bagrakh's clan as a reward for helping King Emeric defeat Ranser, the king of Shornhelm. Kurog then became the king of Orsinium, which subsequently joined the Second Daggerfall Covenant. Another incarnation, sometimes called Nova Orsinium, was created by Gortwog gro-Nagorm in 3E 399. He gathered enough power to force Emperor Uriel Septim VII to formally recognize Orsinium as an equal of the other lesser kingdoms of the Iliac Bay region. 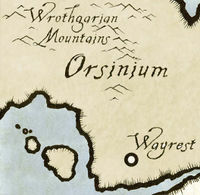 During the Warp in the West, Orsinium was one of the four kingdoms to gain control of the Numidium, conquering the surrounding kingdoms and baronies and swearing loyalty to the Emperor. Early in the Fourth Era, Orsinium was once again sacked by the Redguards and Bretons and presumably eliminated, and many Orc refugees were escorted to Skyrim by the Imperial Legion. The kingdom later re-formed in the mountains between Hammerfell and Skyrim. Even though Orsinium is considered home of the Orcs, they are known to have settlements all around Tamriel. At the time of Kurog's rule, the whole of Wrothgar was dotted with Orc strongholds. The isle of Betony was inhabited by the Seamount Orcs in the mid-Second Era. The Orcs often settled in Skyrim, founding strongholds like Dushnikh Yal, Largashbur, Narzulbur, Mor Khazgur and Cradlecrush. The height of Orcish power in Skyrim came in the mid-Second Era when Yashnag gro-Yazgu established an entire chiefdom in Falkreath before he was killed. Many tribes inhabit Valenwood, known collectively as the Wood Orcs, whereas Iron Orcs inhabit the Dragontail Mountains, particularly the region known as Upper Craglorn. Orcish religion centers around the worship of Malacath, Daedric Prince of Outcasts, also known as Mauloch or Malak. The stories recount that Boethiah "ate" Trinimac and excreted the dung that is Malacath, although Malacath derides the story as being too "literal-minded". A religious order known as the Wrathful Flame bind Malacath's anger to the failures of the Orcs and the destruction of the first Orsinium. Through a pyre burning ritual, Malacath seeks to fuel his followers vengeance every generation. The Orcs have considered themselves outcasts like their deity ever since, and this is reflected in much of their culture. For instance, unlike other races, the Orc tradition is to have weddings take place at midnight. At the time of Kurog's Orsinium, the Orcs of the Daggerfall Covenant claimed that their god Mauloch had nothing in common with the Daedric Prince Malacath, but many other clans disagreed with that view. Near the end of the Third Era, Gortwog gro-Nagorm promoted the idea that the Orcs worship Trinimac again instead of Malacath, a proposition which the majority of Orcs within Orsinium agreed with, while the majority of them outside Orsinium considered it blasphemous. Traditional Orcish society is centered around stronghold settlements, each one striving for complete independence in all matters. Orc society is based on polygamy - a stronghold's tribe is controlled by a chieftain, who is the literal alpha male: no other males are permitted to take wives or father children. The chieftain is replaced by whichever one of his sons grows strong enough to challenge and kill him. The strength of a tribe (and the favor granted to it by Malacath) depends heavily on the personal strength of the chieftain. The law of the Orcs is based on the Code of Malacath, an unwritten law. The Code prohibits things such as theft and unwarranted violence, but also places heavy emphasis on honor and personal strength in resolving conflicts. Orcs do not use imprisonment as punishment: those who violate the code must either pay material compensation or pay a "blood price", which entails allowing the one they offended to spill their blood until the price has been satisfied. Some Orcs use a scale for weighing out blood price amounts, with different gold weights labeled "Chief," "Wife," and "Warrior." In other cases, some Orcs keep detailed a record of all of the grievances and insults their family has suffered, with dates, specifics, and planned responses. Orc women are expected to contribute to the strength of the stronghold just as men, as warriors, hunters, herbalists. Traditionally, the Orcish art of smithing is done by the women, and a chieftain's second wife is called the forgewife for this reason. A wise woman handles a tribe's spiritual matters and healing needs. However, Orcish society is still very patriarchal. All stronghold women are either the wives or daughters of chieftains, with the exception of the wise women, who are the mothers of chieftains. Daughters of the chieftain are usually traded to other strongholds to marry other chieftains. However, many Orcs seek to escape traditional life in the strongholds. Orc women may want to escape being "just another wife" to the chieftain. They leave to join the Imperial Legion, see the world or otherwise seek their fortune; some eventually return to the strongholds, but many do not. Orcs who do not live in strongholds are derisively called "city Orcs" by those that do, and are considered soft outsiders just like non-Orcs. Given their history of provincial homelessness, frequent military service, and the demand for their craftsmanship, it's not surprising that Orcs have traveled all around Tamriel and are now a commonplace sight in cities throughout. Still, Orcs who live in the cities with other races are likely to face prejudice. Their appearance makes interbreeding with other races of Tamriel so rare that it is commonly thought impossible. Orcs are famed for their skill in smithing, particularly with the metal called Orichalcum, which they use to forge armor and weapons. The resulting armaments are heavy and require great endurance to wield, but offer peerless strength and durability. They also work with ebony, and have unique skill in tooling leather for exceptional flexibility and toughness. The precursor to the modern Orcish language is referred to as "Old Orcish". For more information, see the main lore article. Orcs also appeared in the games Arena and Daggerfall, but as monsters rather than a playable race. For Orc names, see here. For game-specific information, see the Morrowind, Oblivion, Skyrim, ESO, and Legends articles. This page was last modified on 15 December 2018, at 17:36.